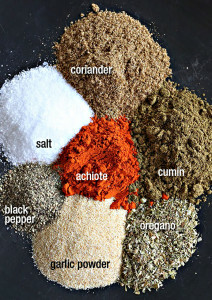 Sazon is like the magic spice blend used to lend an authentic flavor to Latino dishes. Combine all ingredients and mix well. Store in an airtight container. 1 ½ teaspoons of this mix equals one packet of commercial sazon. The key ingredient in this spice mix is ground annatto (achiote), the spice that gives yellow rice that yellow color. Annatto is derived from the seeds of achiote tree. In India, it's referred to as sindoor, and in the Philippines, it is called atsuete. Find it in Hispanic markets, Or use turmeric, paprika, or a mixture of the two. It was often used itself as a substitution for saffron but, of course, saffron would be too expensive as a substitution. 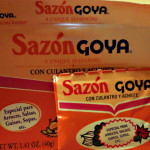 Sazon It's commonly found in the supermarket in small envelopes that you add to stews, beans, rice, etc. It gives yellow rice that yellow color and makes anything taste good! Goya is the most popular brand, Use one and a half teaspoons of this instead of the package. Use this seasoning in Sausage & Cabbage Soup found here.